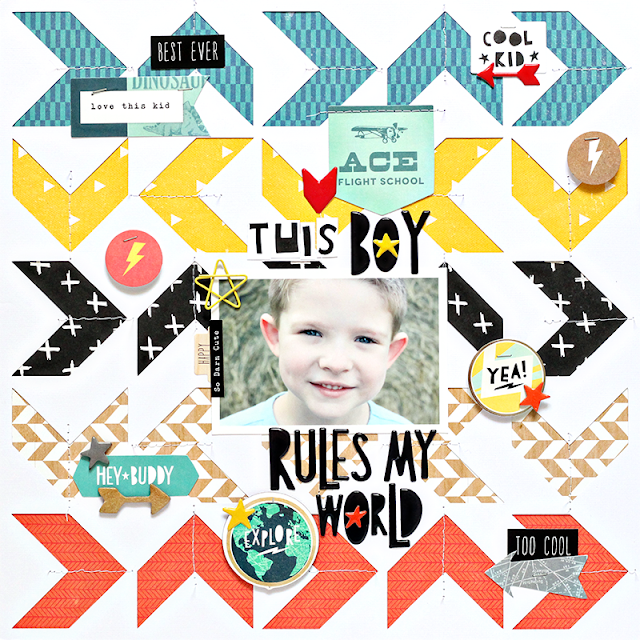 I am so excited to stop in and share my first layout using the new Cool Kid Collection from Crate Paper! If you’re looking for the perfect collection to document the boys and men in your life, then this is it! 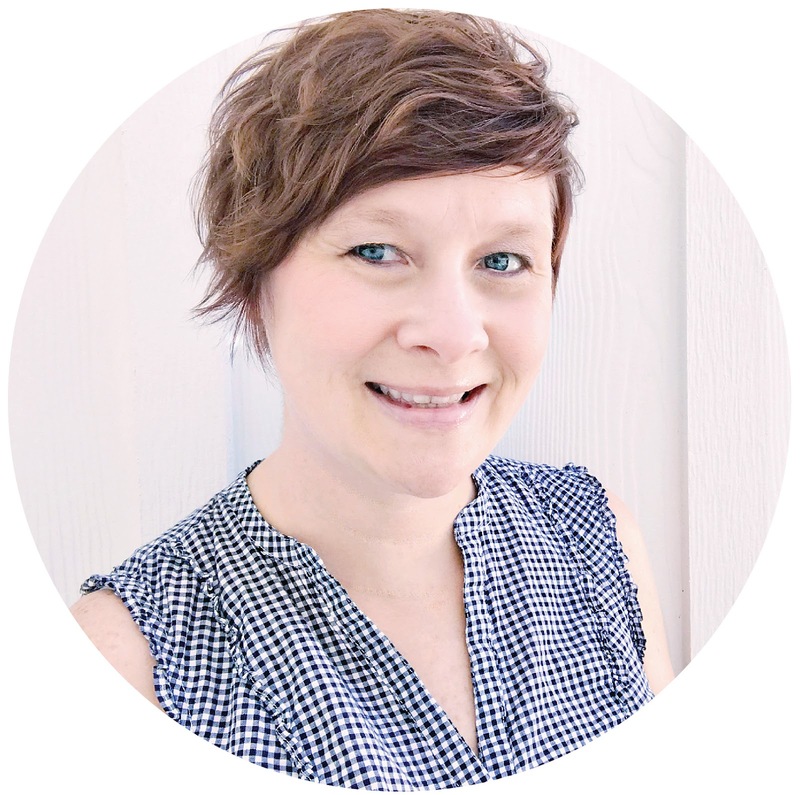 The color scheme of this collection was one of the first things that caught my eye, and I wanted to create a background that allowed me to add multiple patterned papers. 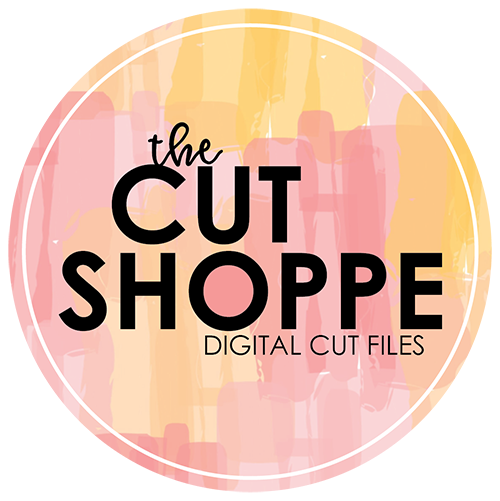 I created a chevron background in Silhouette Studio, inspired by one of my pins on Pinterest. I cut the design from white cardstock and then backed each row of chevrons with five papers from the Cool Kid collection. I also wanted texture in the background, so I machine stitched down the center of each of the chevron shapes. The photo I chose is from our son’s birthday photo shoot. He turned 7 in June! I have been specifically saving this photo to use with the Cool Kid Collection! I placed the photo center stage on the layout and built the rest of the design around it, starting with the title. I really love the puffy phrase and accent stickers. I thought it would be fun to mix up some of the words a bit to create my own custom title. To finish the title, I cut letters for the word “this” from the alphabet border strip on the Run & Jump patterned paper. 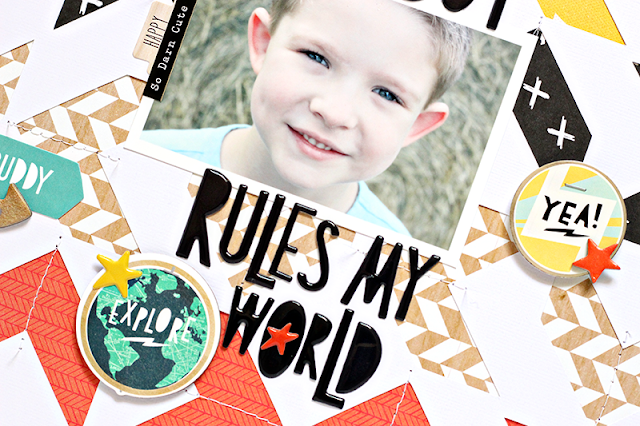 There are so many fun embellishments to use from this collection, and I incorporated a little bit of each of them onto my layout. 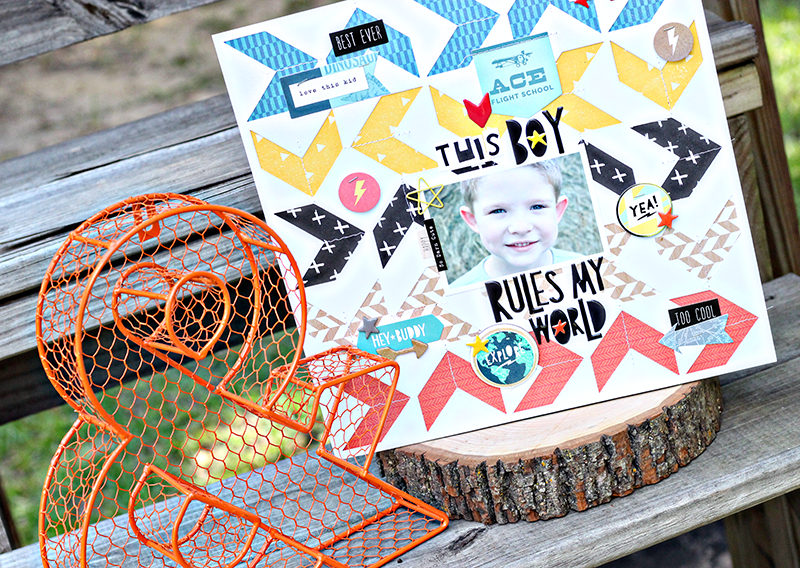 I used the embellishments to create more of scattered look on the page, since my title bordered the photo. I also liked this placement because it adds just enough to the layout, without completely covering the die cut background design. 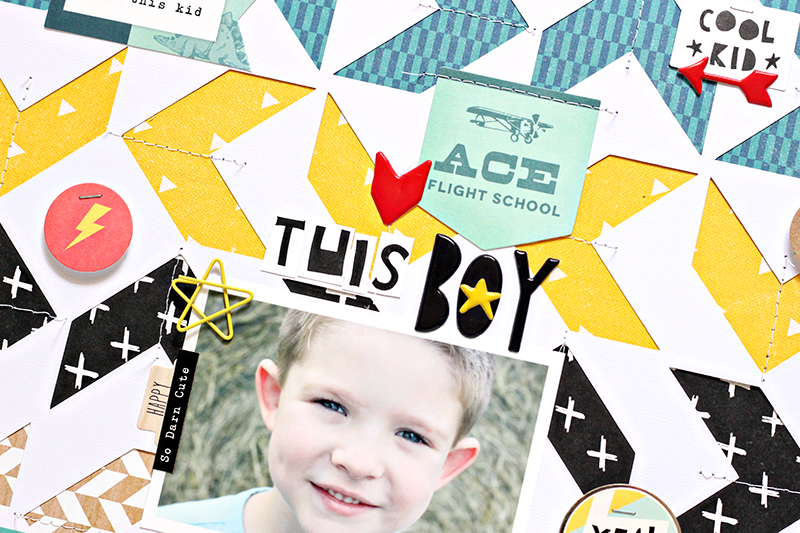 I wanted to work in another texture, so I used my tiny attacher to staple some of the embellishment pieces. I mixed it up and stapled a few right onto the background paper. For added dimension, I popped up some of the Ephemera Pieces and stickers with pop dots and stapled them with the tiny attacher before adhering them to the layout. 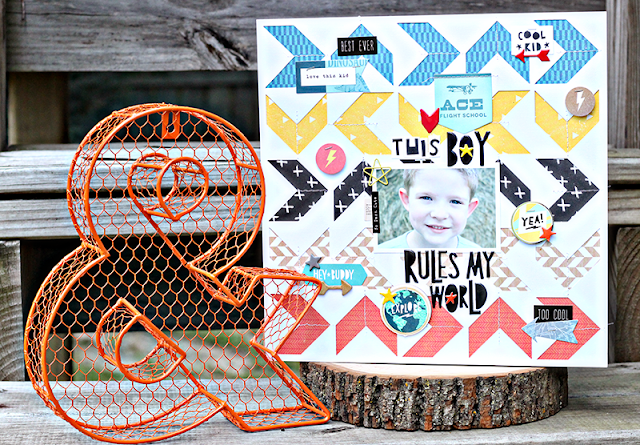 I hope I’ve inspired you with some ideas for using the new Cool Kid Collection! I’m also thinking of different ways to use the collection, other than for masculine themed pages. There’s a great mix of papers and embellishments that I think would be perfect for travel themes, too!